The Nashville Predators have lost four straight games and released their stranglehold on the Central Division, but are finally getting healthy again. The team today activated both P.K. Subban and Viktor Arvidsson from injured reserve, and expect to have them both in the lineup immediately. Subban and Arvidsson have both missed more than a month of game action. To make room, Yannick Weber has been moved to injured reserve. It’s been a tough season for Subban, who has suited up just 18 times for the Predators and has been sidelined since November 13th with this most recent injury. The Norris winner has 12 points on the year and is one of the engines that drives the Nashville attack, something they’ve sorely missed over the last few weeks. The team now sits four points behind the Winnipeg Jets for the Central Division lead, despite allowing the fewest goals in the entire league. Getting Subban back may lead to a few more risky plays, but has always made the Predators a much better team overall given his ability to push the play forward. Arvidsson meanwhile has been out even longer, playing just a single game since October 30th. The diminutive forward has scored 13 points in 13 games this year and is the straw that stirs the drink at even-strength, recording all eight of his goals there. Still just 25 years old, Arvidsson looked like he was playing the best hockey of his career at the beginning of the year and could really push the Predators back into contention for the Presidents’ Trophy if he comes back to full strength quickly. The Nashville Predators have succeeded this year based on the play of Vezina Trophy winner Pekka Rinne’s play. While Rinne has posted a 14-5-1 record, a 1.96 GAA and a .929 save percentage, his backup Juuse Saros, who many felt might share net responsibilities with the 36-year-old Rinne this year, hasn’t fared nearly as well with an 8-5 record, a 3.14 GAA and a .893 save percentage. However, while Saros’ numbers suggest that he’s struggling this season, head coach Peter Laviolette said Saturday that he believes that the team isn’t playing well when the 23-year-old is in net, according to The Athletic’s Adam Vingan (subscription required). While Vingan writes that there is some truth to the comment as the team has had some of their worst defensive showings with Saros in net, including losses to San Jose on Nov. 13, to St. Louis on Nov. 23 and Calgary on Dec. 8. However, when looking even deeper, Vingan notes that both goalies have faced the same number of quality shots per game and it’s just Rinne’s amazing play that has separated the two goaltenders. Sportsnet’s Nick Kypreos suggested (via The Athletic’s Adam Vingan)that the unknown injury that Nashville Predators defenseman P.K. Subban is dealing with has nothing to do with the suspected back injury that he dealt with two years ago. Subban has missed 15 games this year with the undisclosed injury, but Kypreos said that Subban could be out for a bit longer. “It’s a real conservative approach by Nashville to keep him out. They think a 50-plus (game) regular season for P.K. could benefit him,” Kypreos said Saturday night on Hockey Night in Canada. As the holiday season approaches, PHR will take a look at what teams are thankful for as the season heads past the one-quarter mark. There also might be a few things your team would like down the road. Let’s take a look at what’s gone well in the early going and what could improve as the season rolls on for the Nashville Predators. Click here for the other articles in this series. What are the Predators most thankful for? Depth scoring. One of the big strengths the team has is their depth scoring as they have solid lines throughout and scoring seems evenly distributed. Scoring is not an issue as the team averages 3.19 goals per game. The team is ranked 12th in scoring and while only one player has more than 10 goals this season (Filip Forsberg with 14), the team has 12 players with at least five goals and a handful of depth, but quality players who are producing offense, including Craig Smith, Ryan Hartman, Colton Sissons, Calle Jarnkrok and Austin Watson just to name a few. With so much in the tank, the team should be well rested when the playoffs approach. Who are the Predators most thankful for? Many people believed that while goalie Pekka Rinne was coming off a Vezina Trophy-winning season last year, there might be a decline in the veteran’s play after a disappointing playoffs and the fact that the goaltender is 36 years old and cannot be expected to keep up those numbers forever. 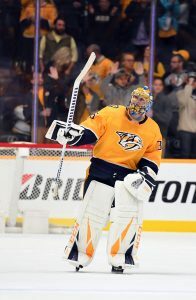 Fortunately for Predators’ fans, Rinne has been outstanding once again as despite missing some time with an injury early in the season, he has amassed a 1.96 GAA in 22 games with a .929 save percentage. Others felt that Rinne might slowly lose his job to goalie-in-waiting Juuse Saros, but so far that hasn’t been the case. The team has been using Rinne quite often and rely on him for the big games. Saros has appeared in just 13 games this season, many of which came during the time that Rinne missed due to injury. What would the Predators be even more thankful for? Despite their success due to their depth players, the team has to hope that they can get some of their top players back from injury. The team’s top goal scorer is Forsberg, but the winger has been out with for more than two weeks and could be out for double that with an upper-body injury. The team hopes to get defenseman P.K. Subban back soon, who has missed a large chunk of the season with an unknown injury, while Viktor Arvidsson has also missed quite a bit of time to injury as well. If the team could get healthy, they may have a chance to fare even better in the Central Division, even though they are just one point out of first place. What should be on the Predators’ Holiday Wish List? The continued development of Eeli Tolvanen. The team had high hopes when they brought Tolvanen over from the KHL at the age of 19. He’s immensely talented and showed some of those skills off in a brief callup when he tallied a goal and an assist in four games while filling in for several of the team’s significant injuries. That, of course, couldn’t last and he was immediately sent down after Kyle Turris returned off the IR. Many people want Tolvanen to remain with the team, but in reality it’s a waste to play him few minutes in Nashville on a bottom-six line. Until he can outplay someone on the top-six, he needs to spend as much playing time as possible in the AHL until his skills can surpass one of their top players. The Nashville Predators big name injury list continues. The team has placed winger Filip Forsberg on injured reserve with an upper-body injury and will be out for four to six weeks, according to The Athletic’s Adam Vingan. Already without Viktor Arvidsson, P.K. Subban and Kyle Turris, Forsberg is just another big loss for a team that has lost three of their last four games. While he wasn’t forced from the game, Forsberg injured his hand during Thursday’s 3-0 loss to Arizona where the 24-year-old played a season-low 15:08 of ice time. He then missed practice Friday and he didn’t participate in Saturday morning’s optional skate. Forsberg’s injury means that 34.77 percent of the team’s cap hit is on injured reserve, according to Vingan. Forsberg has been having a solid season so far this far this year, posting 14 goals in 26 games this season for the Predators, good enough for the team lead. Those 14 goals are way ahead of the pace he has had in previous years. He scored 26 goals a year ago and broke 30 goals the previous two years before that. After 33-year-old Shea Weber underwent knee surgery this off-season, the Montreal Canadiens announced an expected return date of mid-December and even that seemed optimistic. Yet, Weber practiced with the team for the first time this week and now a mid-December return looks very realistic if not excessive. TVA’s Renaud Lavoie reports that Weber is considered to be “two weeks ahead” of schedule and could possibly make his season debut by the end of November or first week of December. Weber is entering his third season with the Canadiens since coming over from the Nashville Predators in the blockbuster trade that sent P.K. Subban packing. Weber’s first season in Montreal was a huge success; the six-time All-Star registered 42 points and a +20 rating in 78 games. Last season was quite different, as the torn meniscus in his right knee limited Weber to just 26 games. When Weber returns to the ice, it will likely be more than eleven months since his last game action. The Athletic’s Arpon Basu asks the fair question of whether or not the Canadiens should expect Weber to be the same player when he returns. Perhaps the even better questions should be just how much Montreal should ask of Weber once he is deemed healthy. Normally, a player of Weber’s age and experience is often expected to jump right back in to his regular role. However, Weber still has eight years left remaining on his contract and the Habs need to consider his long-term health just as much as his immediate impact. Allowing the veteran to ease back into his role gives the team the best chance to once again enjoy his Norris-caliber play, even if it is not this season. Montreal is certainly excited to have Weber back, but considering how well the team has played early on this year, they can afford to give their captain all the time he needs to get back to full strength. If Montreal Canadiens captain Max Pacioretty is being genuine about wanting to stay in Montreal for the rest of his career, the team has a lot of thinking to do whether the 29-year-old winger is worth a long-term deal. Sure, he had posted five straight 30-goal seasons (if you don’t include the strike-shortened 2012-13 year), but after a 16-goal campaign last season and the fact that he’ll be 30 when he starts his new contract, there are a lot of variables that the Canadiens need to consider after the team handed goaltender Carey Price an eight-year, $84MM extension a year ago that’s already starting to look questionable and it hasn’t even started yet. One obvious way for things to work out perfectly would be if Pacioretty can rebound and put up another banner season. Another 30-goal performance would undoubtedly make the 2017-18 season look like a fluke and would make it a whole lot easier to sign him to a new contract, according to Montreal Gazette’s Pat Hickey. However, the scribe also points out that he must improve on his mental game as well as Pacioretty has a tendency to be streaky and get down on himself when he’s not producing. It’s likely, if the veteran captain can’t make that adjustment, he’ll be heading out of town just like Andrei Markov, Alexander Radulov and P.K. Subban did in past years. NHL.com’s Kevin Woodley writes that veteran goaltender Roberto Luongo is focusing more on his health this year after two injury-plagued campaigns that has kept him out of 89 games. The 39-year-old goaltender, who will turn 40 during the season, still has four years remaining on the 12-year, $64MM deal he signed with Vancouver in 2009. He has spent more than 90 minutes a day of extra time with goaltending coach Robb Tallas, focusing on his surgically repaired hip from 2016 and the groin tear he sustained last season. “Back in the day, I used to show up half an hour before I went on the ice and just throw the gear on, but these are the things I need to do be ready, to be loose and make sure everything is working properly,” Luongo said. “The main thing is I understand what I need to do as far as preparation to be where I need to be to be healthy. After my hip surgery, once I started feeling good, I kind of neglected it. You think you are back to normal, but you are not. You always have to keep on it to make sure you keep it strong and loose.” While he’s missed quite a bit of time, Luongo’s numbers haven’t suffered as he posted a .929 save percentage and three shutouts in 35 appearances. Dom Luszczyszyn of The Athletic (subscription required) writes that the Ottawa Senators are considering using newly acquired winger Mikkel Boedker as a first-line option alongside Mark Stone and Matt Duchene next season. Boedker, who was acquired as part of the Mike Hoffman trade with the San Jose Sharks, has posted up-and down numbers the last several years, including a 10-goal season in 2016-17 and then 15-goal season a year ago. The scribe writes that putting Boedker on the first line will be a dangerous combination as Boedker isn’t a great two-way player and historically is a player that thrives on the power play, but rarely during even strength. The Dallas Stars have a tough road ahead of them. With new inspiring head coach Jim Montgomery ready to take the reins in Dallas, the team is eager to force their way to the top of the Central Division, but they also know that if the team can’t sign star Tyler Seguin to an extension sometime this year, everything they’ve worked for could fall apart. The 26-year-old star is coming off a career-high 40 goals, but has also seen his team not reach the playoffs in three of his last four seasons. On top of that, Seguin has not signed an extension as of yet, something that could have happened on July 1. NHL.com’s Mike Heika writes that while Seguin has been careful about what he says about his next contract, he has expressed his love for the city. Heika writes that one obstacle is the team is hesitant to sign any player to a higher AAV than the deal they gave Jamie Benn back in 2016. Unfortunately, Seguin might easily be able to pass that mark as John Tavares recently signed for an $11MM AAV and with salaries increasing yearly, that could be an issue that Dallas might have to re-examine. Dane Mizutani of the Twin Cities Pioneer Press writes that Minnesota Wild winger Zach Parise, who suffered a fractured sternum just three games into the playoffs, says he is 100 percent now and will be ready for training camp. In fact, the 33-year-old feels so good that he has decided to participate in Da Beauty League, a weekly 4-on-4 league, to get himself back into game shape after suffering the injury. Parise, who was one of the top scorers for Minnesota late in the season, including scoring 12 goals over the final 18 games and then three more goals in the first three games of the playoffs, will be a key piece for the Wild to compete for a playoff spot next season. Scott Billeck of NBC Sports writes that the Winnipeg Jets are likely going to have to pay up to sign restricted free agent Jacob Trouba and predicts the team will hand him an eight-year deal. The real question is how much will the team have to pay for Trouba, who has developed into one of the best top defensive lines next to Josh Morrissey. Trouba’s numbers may not look impressive, but he had career numbers in assists per 60 minutes at 1.03 and points per 60 minutes at 1.22. Those numbers actually compare to elite defensemen like Victor Hedman, Drew Doughty and P.K. Subban. Those numbers could bring his pricetag to a very high number. When Shea Weber signed a 14-year, $110MM offer sheet from the Philadelphia Flyers in 2012, everyone knew right away that it would end badly. Yes, Weber was 27 years old and one of the top defensemen in the league, but the contract was top-heavy and carried a $7.86MM cap hit through his age-40 season. The chances of him playing to a level matching that value over a full 14 years was very slim. The Flyers knew this and specifically structured it in a way that they hoped would scare the Nashville Predators and frugal GM David Poile away – it didn’t. The Predators had just watched Ryan Suter walk in free agency and couldn’t afford to let Weber leave as well. They matched the deal and held on to their superstar defenseman. Obviously, the Predators have a lot to lose if Weber retires early. It is very unlikely that Weber, if he makes it that far, is likely to retire with one or even two years left on his contract. At that point, it is likely the Canadiens would just place him on long-term injured reserve to finish his career, as has become a growing trend in the NHL. However, if Weber is unable to get over the injuries that have plagued him in Montreal, could he call it quits within the next few years and stick Nashville with a $3.5-$5MM yearly penalty? Absolutely. It is a scary possibility for the Predators and a situation worth watching as Weber battles back from injury yet again next season and beyond. All salary and cap figures are approximations. Data courtesy of CapFriendly.com.